Planning a vacation? The last thing you’d want is to spend money on a trip that doesn’t meet your standards. These days, there are just as many disappointing resorts and vacations spots as there are impressive ones. But because they all want to make a profit, their websites and social media profiles might all look equally appealing. So how do you weed out the bad picks from the worthy ones? There is no better way to get an honest opinion about a hotel, a resort, or a travel service than through a forum. Here, you can communicate with travelers from all over the globe who are willing and ready to provide you any information you might need to guarantee the best possible vacation for you and your family. 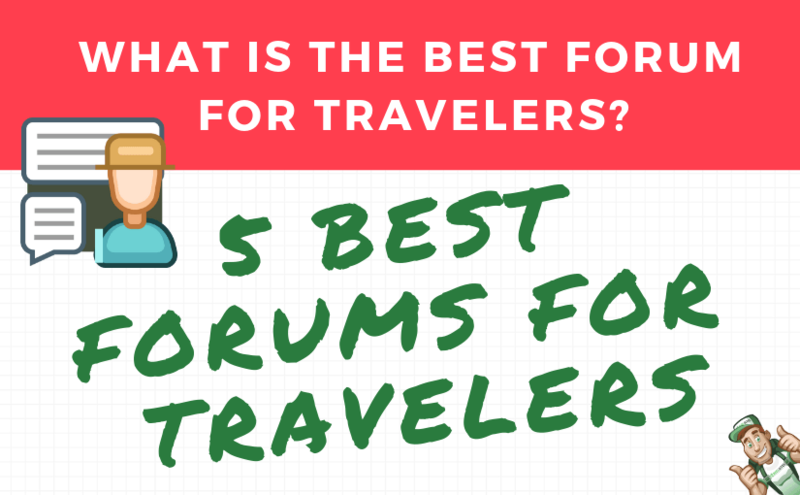 Now, the only question is – what is the best forum for travelers? We weigh in. 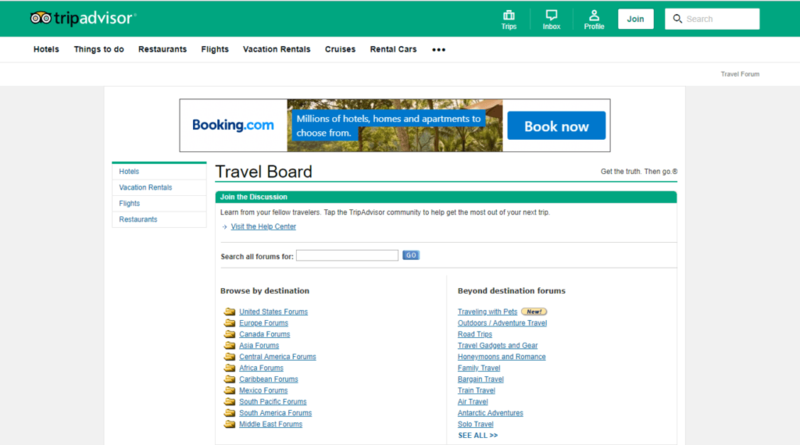 TripAdvisor is one of the most prominent travel websites currently existing. Offering an extensive collection of information on travel destinations from all over the globe, their website is one of the ultimate places to read reviews and find out what other travelers and guests thought of specific locations. Aside from their website though, they also offer a TripAdvisor Forum. This is a space where travelers can ask contributors a variety of questions to learn more about destinations. Boards are divided up by locality, but there are also special boards that answer questions about specific travel plans like honeymoon travel, bargain travel, traveling with pets, and solo travel to name a few. The forum contains lots of great, precise information to help you get a better understanding of your destination before you get there. And like most other forums, the TripAdvisor forum is also open to your own suggestions, opinions, and recommendations, especially on locations that you personally know. If you’re keen on visiting Southeast Asia, you might want to give TravelFish a visit. This independent guide gives you all the information you need to make the right choices based on the information given by their contributors. Aside from the usual travel guides and destination information, you can also read through tips and details on insurance, travel costs, gear, and how to prepare for your trip. What makes TravelFish a great place to check out Southeast Asian information is the fact that they have hundreds of thousands of active contributors at any given time. So it’s easy to get a quick response on a query if you were hoping for timely advice right before you set out on your trip. You may even post on their forums while you’re vacationing to help fine-tune your experience. Just like other forums for travel, Fodor’s Travel Talk is a forum website that lets you share experiences, ask questions, and meet like-minded travelers from across the globe. Their simple interface lets you browse forums based on destination. There are also a variety of other boards that talk about general travel inquiries and concerns. A dedicated thread even lets you read up on trip ideas in case you weren’t sure where to take your family for the summer. 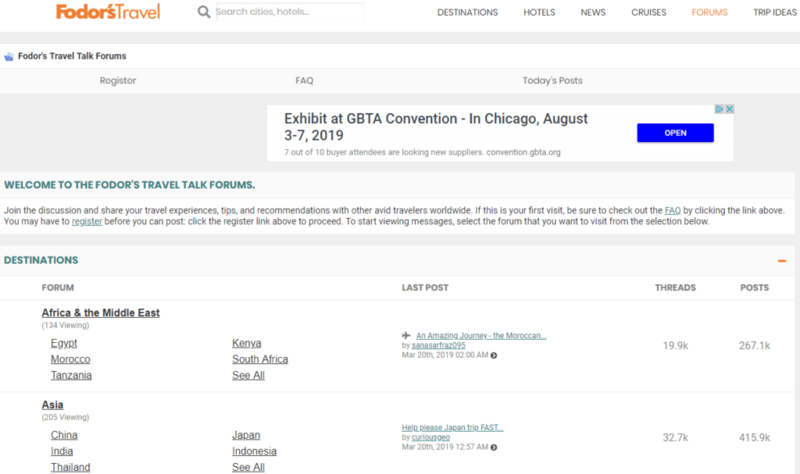 Unlike other forums though, Fodor’s Travel Talk also offers their users the ability to post travel reports. These reports encapsulate a travel experience that their users might want to share. So if you were hoping to get the entire gist of a destination, these reports can help you figure out what to expect, what to do, and how to get around once you land. Lonely Planet is a well-known travel guide that offers individuals comprehensive travel information to help them plan out their trip and make the most of their visit to a variety of locations. They’ve been around since 1972, publishing books and other reading materials to guide travelers before the internet was around for public consumption. 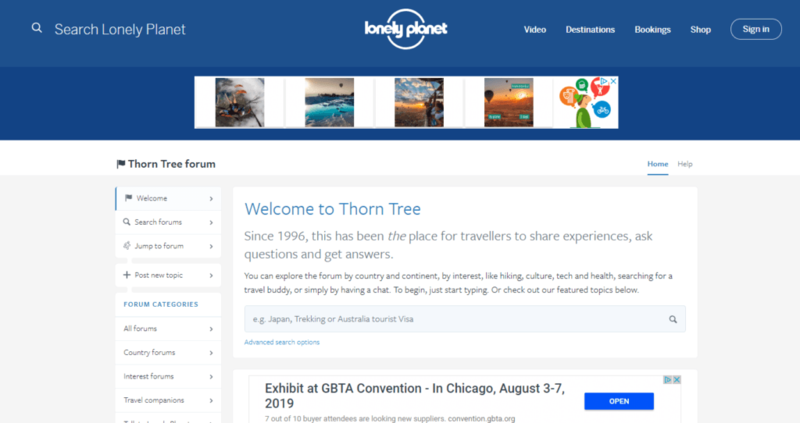 Their Thorn Tree forum is one of the more popular ones today, giving readers an extensive database of information where they can find answers to questions they might have. Their home page also features hot discussions with lots of activity, perfect for those who are looking for a suitable destination for their next vacation. Other than that, tabs on their page also let you navigate through bookings, destinations, and video clips to enrich your research and help you come up with the best possible plans for your trip. Their insurance guides, car rentals, hotel and restaurant recommendations, and many others are sure to help ease the process of figuring out the specifics of your travel plans. If you were thinking of opting for a staycation kind of trip, then Flyer Talk is where you want to go for advice and recommendations. Specializing in hotels, this forum is where travelers come together to talk about different hotels and accommodations from all over the globe. Their comprehensive discussions delve into ambiance, food, service, and overall satisfaction to help you find the perfect hotel for you trip. Of course, contributors also share information on how to save and tips on when and how to book your reservations to get the best value for your money. Information on nearby activities and attractions is also widely shared, allowing you to figure out what to visit to help limit the travel time between your hotel and your itinerary locations. Planning the trip is part of the fun! Make sure you do your research and learn everything you can from people you can rely on before you make a booking. Check out these forums to discover the truths about the destinations available to you and use their information to tailor the perfect itinerary to satisfy your penchant for travel.